Cornwall has always been popular with entrepreneurs looking to escape big city life. 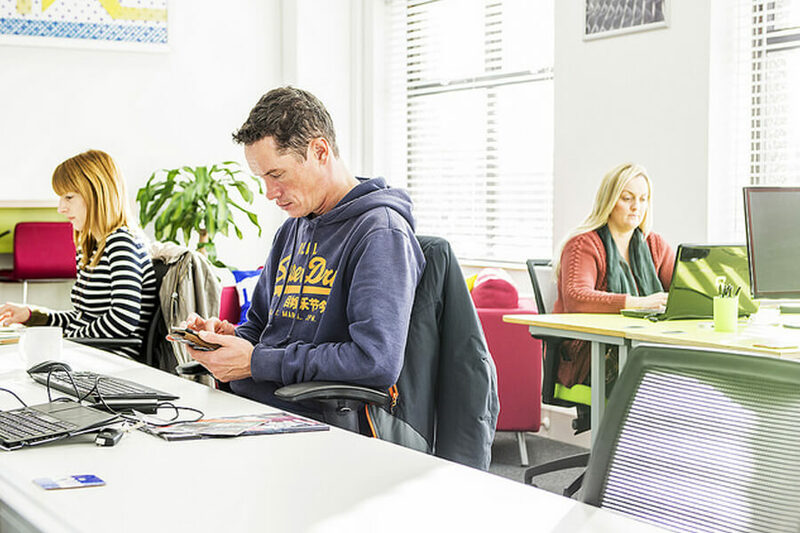 Modern working conditions and the increased number of ‘digital nomads’ means more people than ever are coming to Cornwall to set up businesses or work remotely. Shared workspaces offer people the flexibility to hire any type of space from a single desk to a full scale office surrounded by like-minded professionals. Cornwall Trade and Investment caught up with Matt Miller from Mor Workspace in Newquay to find out more about this new way of working. Why did you set up Mor Workspace? I moved my business to my home office at Pentire in Newquay and thought it would be perfect overlooking Crantock beach, which it was – at first, until I constantly found ways to distract myself, like raiding the fridge on my way past, making cups of tea or sticking the washing on. I thought cafes would be a great place to hold meetings but discovered they’re really places of leisure and full of new distractions if you’re trying to work for prolonged periods. I loved being at home by the ocean, but missed the community aspect of an office, and so the idea for Mor Workspace was born. Mor is Cornish for sea. How is a shared workspace different to an office? I think collaboration is the major difference between an office and a shared workspace. 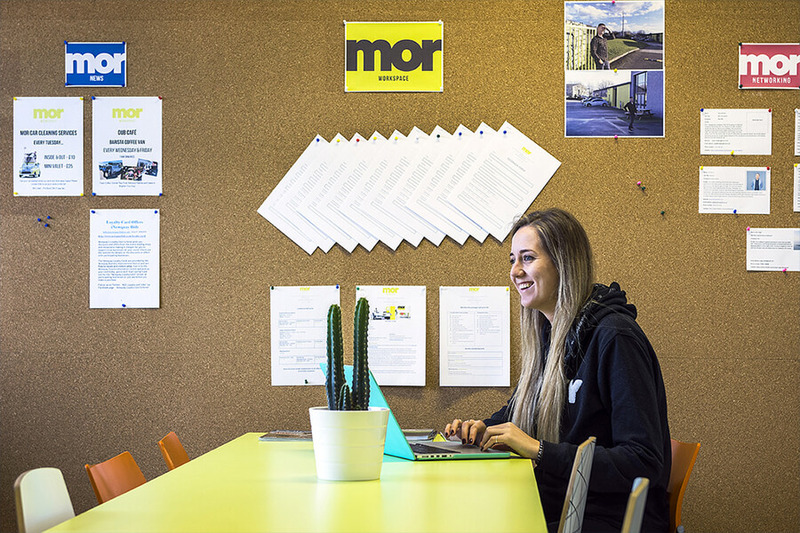 At Mor we have integrated our offices into the shared space, so whether you’re an office tenant or have a desk with us, everyone feels part of the same community. We try and provide an environment where collaboration can happen organically. We’ve had examples in the past where people who are involved in businesses that are not (in the first instance) obviously linked have made a connection and then collaborated on a project together, based on conversations started here – which is great. We also provide activities for members to get involved in such as yoga and after work events. We have a shared kitchen and surfboard room which we find really encourages people to interact and get away from their desk. For us, community is one of the most important things and we’re always looking to add to the community feel here. By offering a number of services, such as car valets and fitness classes, our tenants and co-workers really feel like they’re part of much more than a workspace. What type of businesses use a shared workspace? We get a whole range from single traders to larger anchor tenant businesses. We also get a lot of professionals coming down to ‘test out’ Cornwall as a location. They like the idea of Cornwall but want a low risk way of dipping their toe in the water… Is it viable for location for them? or maybe they’ve been sent to Cornwall on behalf of the companies they work for? Taking a space in a shared workspace is less risky than committing to a full office agreement and offers the option of expansion as well. A shared workspace is a community. It’s much more than just a desk and an internet connection. Many of our members are new to Cornwall so we give recommendations on places to stay, where to go for lunch breaks, places to visit in the evening and weekends. We love living here and want our tenants to experience everything Cornwall has to offer. It was important to me that Mor represented the values and benefits of Cornwall. We are surrounded by beautiful countryside and we encourage our tenants to make the most of being here. Have there been any surprises since opening the space? We are always finding surprises and we’re constantly alert to any changes we can make to improve the space for members. We assumed there would be a lot of seasonality, people wanting to come in for two hours or so a day during the summer holidays and expected not to see them again. That hasn’t been the case at all. Tenants have tended to stay for extended periods which is great for the business, but also a sign of how much Cornwall has changed. Cornwall used to be very seasonal but Newquay is absolutely buzzing all year round and, although it’s busier in the summer, there’s a year round interest in coming to Cornwall, especially from the business community. The popularity of Cornwall Airport Newquay has grown massively over the last few years. How have you benefited from that as a local business? Being close to the airport is hugely beneficial for us and the businesses we have here, as are the improvements to the road network, meaning it’s easier than ever to get to Cornwall. Cornwall used to be a bit of a holiday outpost, but improved transport links has meant people from all over the country are now able to consider it as a genuine option for work as well as play. Modern working practices and Superfast Broadband means there’s no reason to endure a tiresome commute in a polluted city when they can work just as effectively from one of the most beautiful places in the country. The building you have here is really beautiful. What’s the story behind that? It’s great isn’t it! We wanted to provide a unique working environment and part of that is preserving aspects of the original building. There are plenty of original features we’ve kept as a nod to the buildings past. We want people working here to really feel they are in Cornwall and not just in an anonymous office, working with the building is part of that. We have exciting plans for the future as well. We are adding to the facility in Newquay and, as we grow, we’ll be able to increase the community initiatives we offer. We are currently in the 4th phase of the development and are looking to be completed in the next couple of months so that we can begin the next phase. We are also looking at other exciting sites across Cornwall, and want to replicate the success we have achieved in Newquay in other towns and locations. What would your advice be for anyone considering moving or setting up a business in Cornwall? Go for it! Cornwall is an amazingly inspiring place to live and work. There’s so much happening. We might even be getting a Spaceport in Newquay, so that will definitely put us on the map! Grab a desk or office here and see for yourself what amazing businesses and professionals we have down here. It’s a great place to be. We work hard but we play hard too – that’s what it’s all about, isn’t it? Matt Miller was talking to Ross Hulbert, Business Engagement Manager, Cornwall Trade and Investment.